At Northshore Dental and Oral Health we have an experienced visiting prosthetist that will take care of any of your denture issues or concerns. This allows us to have a continual one-on-one approach with our patients. 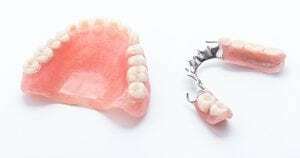 If you need a new full set of dentures or if your old dentures aren’t as comfortable as they once were, we can make adjustments. Dentures are custom-made, removable appliances that were designed to replace missing teeth. 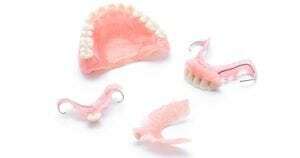 Dentures are made to replace the teeth missing in an arch. Northshore Dental and Oral Health offer either full dentures, or partial dentures. Dentures aren’t permanently fixed in your mouth. They are supported by areas of the mouth, or more generally, wires and clasps. Dentures are usually made of an acrylic material and are designed to mimic the natural colour, shape and function of your teeth. As they are removable, they can be taken out and put back in when needed. Northshore Dental and Oral Health’s ideal candidates for dentures are patients who have experienced significant tooth loss. Having healthy gums and a jawbone is essential. If you are missing one or two teeth, the dentists may recommend a dental bridge over a denture. Depending on each patient’s preferences, a full or partial denture may be recommended. The best way to know if you are a good candidate for dentures is to book an appointment with the team at Northshore Dental and Oral Health. Dentures offer multiple benefits aside from replacing missing teeth. They can prevent your remaining teeth from shifting around in your mouth, causing more pain. Dentures can restore the way you talk, assist with proper chewing and digestion and even rejuvenate your smile. Today’s dentures are much more comfortable and the advanced options available can greatly improve your oral health and general well-being. You have loose or shifting teeth or increasing gaps in your smile. These symptoms may indicate bone loss, which can eventually cause tooth loss. You have already lost multiple teeth. Dentures are a great way to prevent your natural teeth from shifting and can be the most affordable option. Frequent and severe tooth pain. This can be a sign of a decayed tooth pulp, the area inside the tooth. Sometimes when a tooth is too far decayed, conservative treatments won’t be enough to save them. Aesthetic appearance. Some patients opt for dentures as a way to replace their natural teeth they may be unhappy with. Chewing issues. If you find it hard to chew properly, or are having pain whilst chewing this can be an indicator of tooth fracture, gum disease or decay. These problems can often result in patients needing their teeth removed and need tooth replacements. 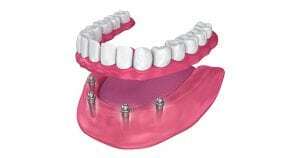 We construct new acrylic & cobalt chrome dentures ,as well as metal free clasps. Also we do implant retained dentures. During your consultation with the dentists at Northshore Dental and Oral Health Pacific Paradise, we will discuss with you the best option for your individual case. It’s important to take good care of your dentures. Daily brushing of your dentures is recommended as well as a cleaning solution to remove food deposits. These solutions can come in the form of effervescent tablets. These are specifically formulated to clean your dentures. Although dentures are made of artificial teeth, plaque and bacteria can still build up and can harm your other, natural teeth and bone. To clean your dentures, remove them and run them under clean water to remove any built up food and bacteria on or underneath your dentures. Brush your dentures all over and soak them in a denture cleaner for an added clean. Also, it’s recommended to avoid using brushes with stiff bristles, whitening toothpastes or products containing bleach as damage your dentures may occur. The dentists at Northshore Dental and Oral Health can teach you how to correctly clean and care for your dentures. How do you fix broken dentures? Because we create and adjust dentures in our Pacific Paradise clinic, we can also fix your broken dentures. By using state of the art specialty equipment our dentists are able to fix new and old dentures. If you need your dentures fixed, want to know more or to book in an appointment, contact the experienced team at Northshore Dental and Oral Health today. Strapped for cash? Don’t worry. For all our services we offer a range of payment plans including zipMoney MediPlan, GE Finance and also an in-house payment plan to ensure patients get our high-class dental care when they need it.We also accept most major credit cards like MasterCard and Visa. And have also recently implemented a HICAPS machine, so you can get your rebate back quickly, and easily.